If you have a green thumb, want the freshest hops, and want to know where the hops came from, the best thing you can do is grow your own. Having your own hopyard adds another element of control within your brewing process and adds even more personality and uniqueness to your homebrewed concoctions. Unless you plan to use all of your harvested hops in a wet hop beer, then after harvest you need to dry the hops before packaging and freezing them. The best way to dry your freshly picked hops in order to preserve all of those wonderful flavor-boosting oils, acids, and compounds is with a hop oast. When designing the oast, I wanted to limit the amount of heat that was applied to dry the hops since certain oils begin to evaporate at higher temperatures, changing the flavors that are imparted in the beer. The intent was to keep as many of the oils as possible in- tact to maximize the flavors in my beers. I needed a lot of drying space as I was anticipating several pounds of dried hops at harvest time. I also did not want this to take up a lot of real estate, as it was going to be a part of my limited garage brewing space. I drew inspiration from a box design that fit all of my needs on Instructables.com, which was adapted from The Homebrewer’s Garden: How to Easily Grow, Prepare, and Use Your Own Hops, Malts, Brewing Herbs by Dennis and Joe Fisher. This project took roughly four hours to complete. However, the benefit of this build allows me to get nearly 20 pounds of wet hops to their dry storage weight in little time without using heat to potentially drive off those wonderful aroma and flavor compounds that make hops the earmark of certain brewing styles. Measure the lengths for the sidewalls of the trays and mark your cuts on the plywood. I made my oast six levels (one of which holds the box fan), so I measured 24 sidewalls that are 24 inches long by 6 inches tall (61 cm long by 15 cm tall). I found the most efficient use of the plywood was to cut it in half and cut 12 sidewalls as shown in this figure. The leftover 24-inch by 24-inch squares (61-cm by 61 cm) will be the base that holds the box fan and the top lid of the oast. Once measured, make your cuts. Measure out 24 5-inch (13-cm) segments on the furring strips. These strips will help to strengthen each of the trays in the corners. Measure out four 221⁄2-inch (57-cm) sections on the 2×6 board. This will become the sturdy base of the oast. Now assemble the base by taking the four 221⁄2-inch (57-cm) planks and screwing them together as a box using 3-inch (8-cm) screws. This should make a perfect 24-inch (61-cm) square for your base panel and will be a solid foundation for all of the trays to rest on top of. I nailed the base panel to the 2×6 base using brads, and drilled nine 2-inch (5-cm) holes on the plywood base panel and one in the back. This is to allow air into the oast to be circulated by the fan. Using the brad nailer (or 11⁄2-inch/4-cm wood screws if you don’t have one) fit the oast walls together with the 24-inch by 6-inch (61- by 15-cm) tray walls, 5-inch (13-cm) shanks, and the right angle. If you are using screws, you can screw three screws into each end of the tray walls and the 5-inch shank (13-cm). This will make six oast sections, but one will house the box fan. If you choose, you can forego the box fan housing and make a sixth tray. The box fan will fit snugly onto the base. Alternatively, an option is to place the housing with the box fan at the top of the oast and blow the air down through the hops. Then cut 2-foot (61-cm) square sections of the screen and staple the screen to the bottom of each oast tray. Take a hammer and tap in all of the staples so that they are nice and even. Stack each of the oast sections on top of the base. I used some leftover scrap wood to create guides for the trays and affixed them using the brad nailer. This will hold them in place as I adjust the trays. Lastly, put the 24-inch (61-cm) square lid over the top oast section. I harvested in two rounds based on my feel of the Zeus and Nugget cones. This oast dried over 17 lbs. (8.6 kg) of wet Chinook, Cascade, Nugget, and Zeus to just over four dry lbs. (1.8 kg) of hops. Without using any heat, my first round of hops — about 5 wet lbs. (2.3 kg) — were in the dry range (20-25% of the original weight) in two days. The second round of hops — about 12 wet lbs. (5.4 kg) — were in the dry range in three days. For this drying, I reversed the draft to pull air through the hops from top to bottom by flipping my box fan over, as opposed to pushing air up through the bottom layers of hops. Both ways worked well. One suggestion I have is rotating the drying racks to minimize a gradient from bottom to top, or top to bottom, depending on the fan location and orientation. Now I have a freezer full of hops that I have to begin brewing with! 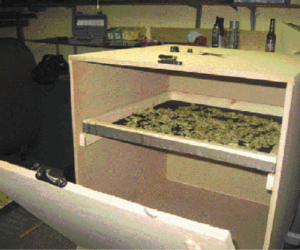 Sure, you could dry your homegrown hops on an old screen, but wouldn’t you rather build your own oast? Add a hoppy aroma to your brews with a homemade hopback.